An estimated 3,500 people came from all over the United States for the Esh family funeral after three generations of family members where killed in an accident on I-65 on Friday. John and Sadie Esh were killed along with their four children; Anna, Rose, Rachel and Leroy. Leroy's wife Naomi was also killed along with one of their three adopted sons, Jalen, who was 2-months-old. Their other two sons, ages 3 and 5, survived the crash and are being cared for by other family members. Rachel's fiancé Joel Gingrich also died along with a family friend, Ashley Kramer. 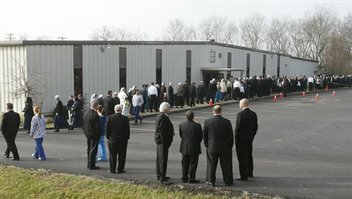 On Monday in Franklin, KY nearly 600 people gathered to remember her. The truck driver, Kenneth Laymon, who was also killed in the crash will be laid to rest Wednesday in his hometown in Alabama. His sister said he was an experienced and careful driver. Officials still don't know why his semi crossed over the median. Bill Miller, a member of the Marrowbone Christian Brotherhood Church, said this was planned by God for a reason and that Church members accept that reason and move on.